U.S. Pat. No. 5,769,724: Human free-flight catapult. JW Note: Reference numeral 7 in the below figure points to the “human rider.” I’ll stick with roller coasters, thank you. U.S. Pat. No. 4,639,236: Toy vehicle and launcher. This invention relates to a toy in general and in specific to a novel toy into which a simulated explosive charge is placed to propel the toy from the charge. It is known in the art of toy design to provide various simulated events which stimulate the imagination of the user. Such would include simulated rocket launchers for example, or simulated guns which make noise or flash light. It would also include, for example, toy planes or autos which separate into pieces under simulated crash conditions. The present invention adds a different dimension to simulated or imaginary activity in that it creates the fanciful impression that the vehicle is being blasted on its way by an explosive charge. For only the second time in a hundred years, the United States Patent and Trademark Office (USPTO) has redesigned the patent grant cover. 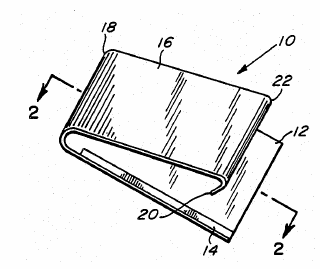 Often decorated with an iconic ribbon and seal, patent covers are what we generally think of as the physical award document issued to inventors. The USPTO will unveil the new cover design at this special South by Southwest (SXSW) event and discuss the significance and history of the document with intellectual property stakeholders and the press. Happy Valentine’s Day 2018 from AT! This invention relates generally to greeting cards, and more particularly to a mailable card which not only conveys a greeting and a message related to the greeting, but also an aroma associated with the occasion for the greeting. . . .
By way of example, we shall assume that the occasion for a greeting card in accordance with the invention is Valentine’s Day. This day which is celebrated annually on February 14, is a holiday in which it is customary to exchange romantic messages, called Valentines. While in the United States, the first Valentine’s Day greeting card was produced in 1840, today millions of such cards are sold annually. Happy National Inventors’ Day 2018! In recognition of the enormous contribution inventors make to the nation and the world, the Congress, pursuant to Senate Joint Resolution 140 (Public Law 97 – 198), has designated February 11, the anniversary of the birth of the inventor Thomas Alva Edison who had over 1,000 patents, as National Inventors’ Day. Presenting on Intellectual Property Law to the Inventors’ Association of Metropolitan Detroit – February 15, 2018. The Inventors Association is a non-for-profit association established to educate inventors of all levels to navigate through the inventing process. In addition to being an important resource center, IAMD serves as a support group for inventors, who can exchange information, experiences and other advice on how to successfully complete a project. February Meeting: Jacob Ward- Registered Patent Attorney admitted to practice in the State of Michigan, before the United States District Court of the Eastern District of Michigan, and before the United States Patent and Trademark Office. He is also registered as a patent agent, non-resident, in Canada. There is a $5 guest fee to attend the meetings (but your first visit is free and annual membership is $30). The IP Watchdog blog recently published an updated listing of the top patent law blogs. We are proud to report that the Anticipate This!™ | Patent and Trademark Law Blog has once again been named among the top patent law blogs in this listing! As mentioned in the article, AT! has always been about sparking interest in patents, and having fun. Other blogs are more academic and much better at breaking news – but we’re very happy with our niche. Looking forward to many more years of patent blogging, and bringing patents to the masses! The full table of patent law blogs in this year’s listing is reproduced below. U.S. Pat. No. 4,646,382: Lottery ticket scraper. Human history is cyclic. Civilizations rise from primitive cultures or previously decadent and crushed civilizations, often after a long period of darkness. As civilizations begin a birth, or the rebirth, moral values of the group, and ultimately of the individual rise and become dominate. The wealth of civilizations is often first enjoyed only by a small, select few, sometimes determined by heredity and sometimes by ability. The recognition of moral values, the integrity of the individual, the responsibility of each individual to look after his own needs and to care his own rises as a civilization grows toward maturity. Gradually, the oppressed and the less fortunate begin to partake of the feast of civilization and the conscience of society is turned toward taking care of those who are unable to care for themselves.